Available on Remix EP #2. 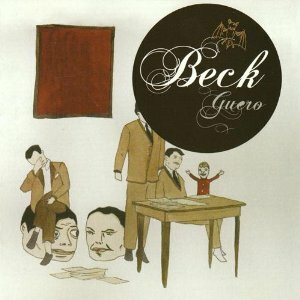 "Go It Alone" is one of my favorite tracks on Guero, as it is one of the grooviest songs Beck has recorded. Jack White from the White Stripes plays an infectious lead bassline (and co-writes the song), as Beck harmonizes a lot with himself and lazily raps over it all. And there's still a bit of a bluesy touch to the groove, which I think really makes it stand out even more. The simplicity in this recording reminds me of other songs on Guero (like "Black Tambourine"), but while some of those play with building off rhythm, "Go It Alone" builds off a groove. There is a bluesiness to the groove too, which makes it feel unique. Beck was asked about the collaboration, and said Jack White walked in, picked up a bass, started playing, and they literally took five minutes to put the song together. (It doesn't have a complicated construction.) He also has said that Jack was in town for a few nights, and they messed around together, creating songs, and this was the idea that "bore fruit." Hard to believe the other songs weren't interesting on their own right! Anyway, "Go It Alone" begins with a very effective image of a character: "I'm coming over / See me down at the station / By the lane / With my hands in my pocket / Jingling a wish coin / That I stole from a fountain / That was drownin' / All the cares in the world." Beck occasionally does this sort of constant extending of sentences, which I always enjoy and find striking. Standing at a station, presumably watching someone leave, hands in pocket, wishing things were different. He's been left to go it alone. He doesn't want to. Perhaps somewhat surprisingly, Beck and his Guero/Info band never played "Go It Alone" very regularly. We have it for just 14 setlists over the two years of touring. The song was not played at all during the Modern Guilt tours, and then Beck took a few years off the road. In 2011, Beck made just five live appearances, and one was a benefit gig in San Francisco. He put together his band for it, but also used a local jazz band for horn flavor. Together, they did bring back "Go It Alone." I don't know of a recording of this show, but I'm curious if they added horns to "Go It Alone": might have been a fun new touch to the song! The song then was not played at all during the tours of 2012/2013, nor the Morning Phase tours of 2014. Since 2014 however, the song crawled back into view and now is a regular! Beck played the song just 5 times in 2015, but the test must have been successful, and he played it almost every show in 2016 and 2017 (except a couple of shortened festival sets). The 2015 version is chunkier, less smooth groove. They also do not play the third verse, moving straight from the middle bridge to the chorus/outro. No matter how many times I hear it, I always expect a verse there and it feels odd not getting it. The song carried over as a regular into the Colors tour as well, though by the end of the run it had slipped to something more infrequent. It was played at 31 of first 44 shows, but only 4 of the last 15. Beck said on twitter at one point that "Go It Alone" was a song he really enjoyed playing live nowadays, and it does seem to be one that backs his oft-stated theory that songs sometimes take a time before they settle on the audience. ("Go It Alone" took 10 years!) The Colors tour was the same band that Beck started with in summer 2017, and they continued the same as above: a little less raw, more professional, funky audience singalong. Jason's ending solo, now formalized, still steals the song. An early leak of Guero hit the web 3 months before it was released. Most of the songs sounded the same, but some had slightly early mixes. "Go It Alone" the best I can tell sounds exactly the same, except it lasts around 10 seconds longer (I believe just the little organ riff at the end is extended). Some reports of the Jack/Beck Guero collaborations said they did two songs together, the other one being unknown at this point. Another report made it sound like there were a bunch more, and to expect more future collaborations. Beck and Jack White are friends who have worked together quite a bit. Live, Beck has covered "Black Math." Jack White has shown up at a couple of Beck concerts over the years, joining in on "Cold Brains," "99," and "Last Fair Deal Gone Down." Beck showed up once at a White Stripes concert to play bass on "The Denial Twist." In the studio, Jack White plays bass on "Go It Alone." Beck produced (in his living room, no less), and played, on a Stripes single with these songs: "Honey, We Can't Afford To Look This Cheap," "It's My Fault For Being Famous," "Conquest (Mariachi version)," and "Cash Grab Complications On The Matter." Beck was in a White Stripes music video as well.